The introduction of Azure Role-based certifications from Microsoft was a part of its core strategy to entirely restructure Microsoft Learning portal so as to encompass specific technical job roles & requirements. The primary goal of each of this new role-based certification is to analyze and assess the skills and expertise of a candidate in the particular domain. There are specific exams designed to move a candidate on this certification path. To get a role-based certification, a candidate has to pass all the exams listed under certification requisites. But if he/she has passed the previous exams like 70-533 or 70-535, things will be different. Then the candidate only needs to pass the Azure transition exam for the specific role to upgrade the old exam. What are the Azure Transition Exams? Azure transition exams are the transition certifications that will upgrade the old exams. AZ-102 is the transition exam for exam 70-533, AZ-202 is for the exam 70-732, and AZ-302 is for the exam 70-535. Exam 70-533 is the Microsoft Azure exam intended for implementing Azure Infrastructure solutions. This exam was first released on 4th September 2014. From that time onwards, this was one of the major Microsoft exams targeted for Azure Administrators. And qualifying this exam would get credited towards many certifications such as MCSE, MCSA, and MCP. Exam 70-532 is the Microsoft exam intended for developing Microsoft Azure solutions. This exam was first released on 1st on September 2014. Since its launch, it has been one of the major Microsoft exams for the Azure Developers. Passing this exam would count towards certifications such as MCP, MCSD, MCSA, and MCSE. As compared to 70-533, the exam 70-535 was relatively new. This became available from November 30, 2017. It was intended to cover a more advanced level topic such as “Architecting Azure solutions”. Passing this exam would count towards certifications such as MCP, MCSD, MCSA, and MCSE. Preparing for the AZ-302 certification exam? 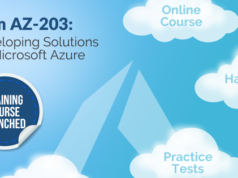 Check your current level of preparation with Azure AZ-302 Practice Tests. Are the Exams 70-532, 70-533, and 70-535 Still Valid? No, the validity of these exams has been over and the exams are not valid now. Microsoft had officially declared that these exams would retire on December 31, 2018. So, the links to take these exams aren’t available now. If you are still planning to take these exams, it is good to skip that plan now itself. Why did Microsoft Retire These Exams? As per the new Microsoft’s policy on certifications and exams, the company is completely moving to performance or role-based certifications. With this policy, the exams starting with number codes such as 70-532, 70-533, etc. may retire sooner or later. Will it become worthless If I’ve Already Passed Any of These Exams? Yes, it can be. But if you are able to pass an Azure transition exam within a time limit, there is no worry. You can save your efforts and time incurred for the preparation of the old exams. These Azure transition exams are available all three i.e. 70-532, 70-533, and 70-535; the Azure transition exams for the old exams are AZ-202, AZ-102, and AZ-302 respectively. Azure AZ-102 exam is the transition exam for those who have already taken the 70-533 exam. Follow this AZ-102 exam preparation guide to pass the exam. Microsoft provides Azure upgrade exams (known as the Azure transition exams) for each role among the old Azure certifications. 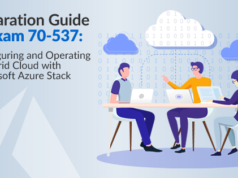 For example, 70-533 was the Microsoft Exam for Implementing Microsoft Azure Infrastructure Solutions. Now with the role-based certification, candidates are required to pass two separate exams namely AZ-100 and AZ-101. For those who have already passed the 70-533 exam, they just require to pass a transition exam namely AZ-102 in order to get Azure Administrator Associate certification. This is true for other Azure roles as well. If you have passed the 70-535 exam i.e. Architecting Microsoft Azure Solutions exam, you need to pass the transition exam AZ-302 to become a Microsoft Certified Azure Solutions Architect Professional. Similarly, if you have passed the exam 70-532 exam i.e. Developing Microsoft Azure Infrastructure Solutions, you need to pass the AZ-202 transition exam to become an Azure Developer Associate. Have already passed the 70-535 exam? Follow this AZ-302 exam preparation guide and get ready to become a Microsoft Certified Azure Architect. How Long will be These Azure Transition Exams Available? Since the transition exams like AZ-102, AZ-202, and AZ-302 are solely meant for the candidates who have passed in exams like 70-533, 70-532, and 70-535 respectively; these exams will be available only for a limited period of time. According to the latest update from Microsoft, these Azure upgrade exams are scheduled to be retired on June 30, 2019. Also, note that passing a transition exam without already have been passed the old exam give you any credential. For example, if you haven’t already passed the 70-535 exam, there is no meaning to take AZ-302 exam. In that case, you’ll have to go for the new path i.e. AZ-300 and AZ-301. What is the Cost of Taking Transition Exams? For all the transition/upgrade exams as we have already discussed, the exam fee comes in the same scale. For example, if you are living in the United States, you have to pay $99 for appearing any of these exams. Anyway, the exam fee is subject to change with your geographic location. If you are a student having valid academic credentials, you are eligible for a fee deduction. Have already passed the 70-532 exam? Follow this AZ-202 exam preparation guide and get ready to become a certified Azure Developer Associate. Will the exam Modules be Hard? Since each of these transition exam targets at upgrading from an older one, the topics that come under the transition exam will be a mix of topics from the new role-based exams. 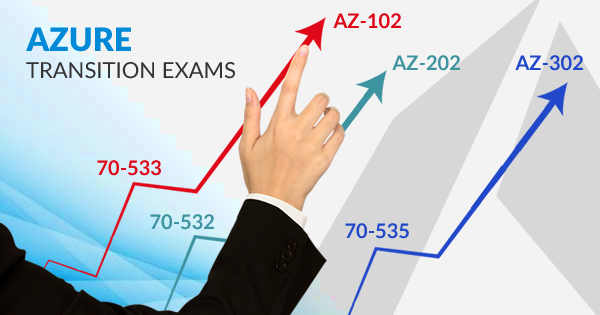 For example, the AZ-102 transition exam modules will be taken from both AZ-100 and AZ-101 exams. Same is the case with AZ-302 exam where you can expect exam topics from both AZ-300 and AZ-301. Although the exams such as 70-532, 70-533, and 70-535 are very suitable in examining a candidate’s proficiency and expertise in different Azure services, these are outdated with the modern role-based structure of Microsoft exam. So, if you don’t want to waste your efforts and cost for any of these exams, you should take transition/upgrade exams as soon as possible. Are preparing for these Azure Transition Exams? Whizlabs Azure Certifications training courses will help you prepare and pass these azure transition exams. Since you have already passed an exam like 70-532, 70-533 or 70-535, the transition exam won’t be harder for you. Want to know more about these new Microsoft Azure certifications? Just submit your questions in the comment section below or start a discussion at Whizlabs Forum to get answers by the experts.